The third farthing was a British coin (1/12 of a penny, 1/2880 of a pound) which was produced in various years between 1827 and 1913. The coin was produced in 1827 exclusively for use in Malta, but it is considered to be part of the British coinage as at that time Malta was considered more as a part of Britain than a colony. The farthing coin was already in circulation in Malta, as a 3 grani coin, and the third farthing was introduced as 1 grano. A proclamation issued in Malta on 3 November 1827 legalised the new coins, referring to them as British Grains. The cost of living in Malta was lower than in Britain, and it was not considered appropriate to introduce them in Britain. The obverse of the 1827 coin bears the left-facing portrait of King George IV, with the inscription GEORGIUS IV DEI GRATIA 1827 while the reverse shows a seated Britannia with shield, facing right and holding a trident, with the inscription BRITANNIAR REX FID DEF. There was no indication of its value. The coin was made of copper, weighed 1.5 to 1.6 grams, and had a diameter of 16 millimetres. In 1835, in the reign of King William IV there was another issue, also of copper, 16 millimetres in diameter, and weighing 1.5 to 1.6 grams. The obverse of this coin bears the right-facing portrait of William IV with the inscription GULIELMUS IIII DEI GRATIA 1835, and the same reverse as before. Comparatively few coins were needed for Malta in the reign of Queen Victoria, so copper third farthings were only minted in 1844, to the same physical standards as before—the obverse shows a left-facing portrait of Victoria inscribed VICTORIA DEI GRATIA 1844 and the reverse shows the seated Britannia with the inscription BRITANNIAR REG FID DEF. By the time a further mintage of the denomination was needed, in 1866, the coins were made of bronze, and were only 15 millimetres in diameter, weighing between 0.9 and 1.0 gram. The inscription around the Queen's head this time was VICTORIA D G BRITT REG F D, while the design of the reverse contained a crown over the words ONE THIRD FARTHING date within a wreath. The issue was repeated in 1868, 1876, 1878, 1881, 1884, and 1885. At the start of the reign of King Edward VII, in 1902 a further £100 worth of the denomination (i.e. 288,000 coins) was produced, to the same standards and reverse design as before. 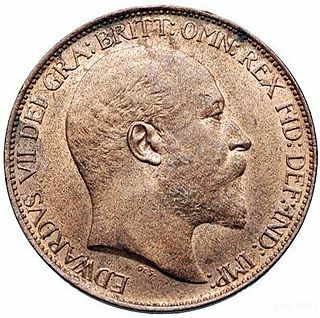 The obverse shown the right-facing head of King Edward VII and the inscription EDWARDVS VII D G BRITT OMN REX F D IND IMP. In 1913 a final issue of £100 worth of coins was made, bearing the left facing head of King George V with the inscription GEORGIVS V D G BRITT OMN REX F D IND IMP on the obverse, and the same reverse design, size and weight as before. In 2017 values, the third farthing would have a purchasing power of between 4p and 5p (£0.04 to £0.05). British Coins - Free information about British coins. Includes an online forum. The double florin (4/-) was one of the shortest-lived British coin denominations ever, only being produced during four mint years, between 1887 and 1890. The silver coin weighed 22.6 grams (0.80 oz) and was 36 millimetres (1.4 in) in diameter.